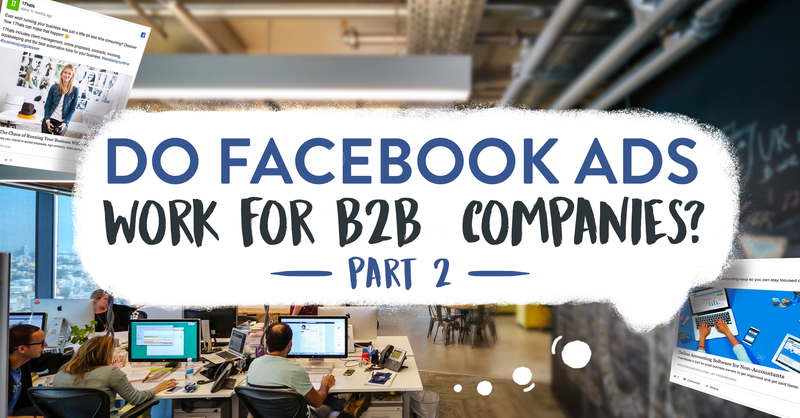 An example of a real B2B business who succeeded with Facebook Ads! Companies that remain skeptical of Facebook Ads potential are missing out a big business growth opportunity. If you’re willing to give Facebook Ads a chance, you need to know the right objectives for a B2B campaign on this platform. As a B2B, you should focus on these four objectives on Facebook- and have you noticed they’re also the four stages of the sales funnel? Makes sense, right? It’s essential to build your campaigns based on your business funnel and goals. The other campaign objectives are best suited to B2C goals. Don’t waste your time. All clear? Let’s move on to audiences! When you know who your buyer persona is, it’s easier to find them! For example, if you’re targeting small businesses, using the “employers” will let you find them- and target them based on where they work. Another best practice is to use Lookalikes– people similar to ones you already know who could be interested in your business as well- for example, your customer list! To learn how to create a lookalike audience, click here. 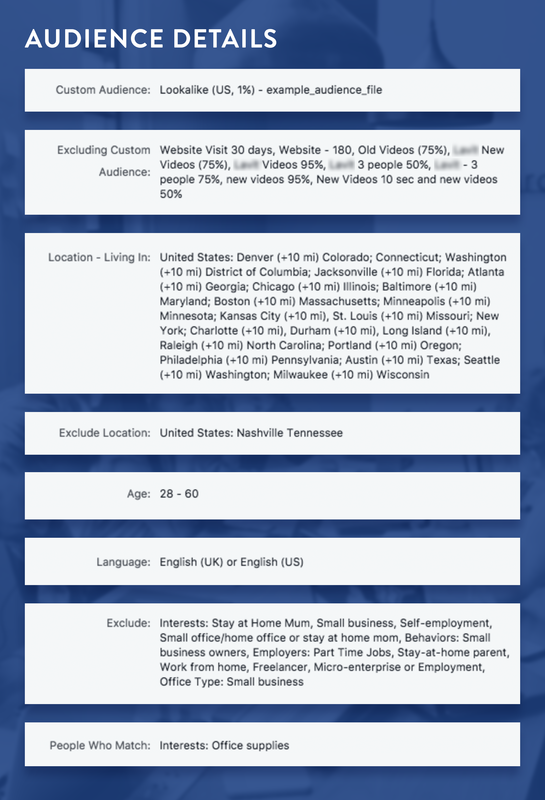 Here is an (anonymized) example of one of our clients, a B2B business who succeeded with Facebook Ads. The client wanted to drive awareness and break into new B2B markets- more specifically, offices with more than 20 employees targeted to their business- so they hired Motion Ave to understand the target audience better and optimize their marketing budget through Facebook Ads. As a less well-known brand in the US market, we knew the most effective way to reach the audience would be by creating a campaign that would demonstrate the product’s value in a credible and relatable way. Thus, our initial strategy objective was to create awareness. To identify the most viable opportunities for extensive brand awareness, we conducted broad audience testing: conducting several split tests, we discovered that of the 50 U.S. states, nineteen didn’t show an active interest. Excluding them from subsequent campaigns, we focused on the thirty-one states where we saw opportunities, and identified those with commercial activity, meaning they had more conversions and were more engaged with the product. We additionally tested different creatives, finding that videos had a better performance than other ad formats- and not only was format essential, but appropriate content as well. Testing showed videos highlighting the different features of the product worked better than images of the product alone. In general, videos with copy explaining the benefits and the value of the brand had a better performance. Testimonials were another fantastic finding that we implemented after demonstrating great success in testing. We partnered with some of the brand’s happy clients and created video testimonials of actual people using the product and giving feedback. Based on our target audience for Facebook advertising, we focused on ways of introducing the brand to companies of 20+ employees, showing the value of the brand with different visuals mainly in a video format type to attractively portray product benefits. Here are some examples of the audiences we used in the campaigns. Thanks to effective use of Facebook Ads, the client extended the brand’s reach online, introducing the brand to new B2B markets and reinforcing its credibility in the category. Most importantly, the campaigns drove leads that turned into customers and brand awareness in desired demographics in the United States, encouraged product trials, and sales. 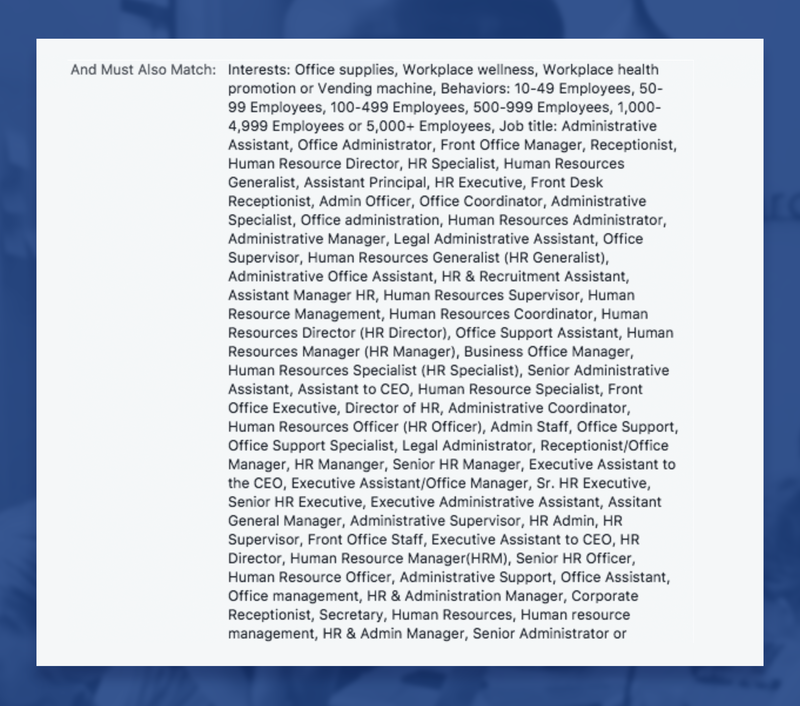 It’s fascinating how many different strategies you can implement on Facebook Ads, but it’s crucial to always test and experiment. Want some assistance in producing winning B2B campaigns? Get in touch with us. We’re passionate about great advertising, creative content, fun design, and helping people succeed in telling their brand’s story.